Labor Day weekend just got a whole lot better here in Denver. Our good friends at Red Bull and DJ Low Key are putting together a block party of epic proportions here in the Mile High! On September 1st, 2018, Red Bull Music presents a Goodness Block Party with DJ Low Key & friends. A celebration of Denver music and community, the day-long event is inspired by DJ Low Key’s longstanding party “Goodness” a signature event of the city’s RiNo neighborhood since 2012. 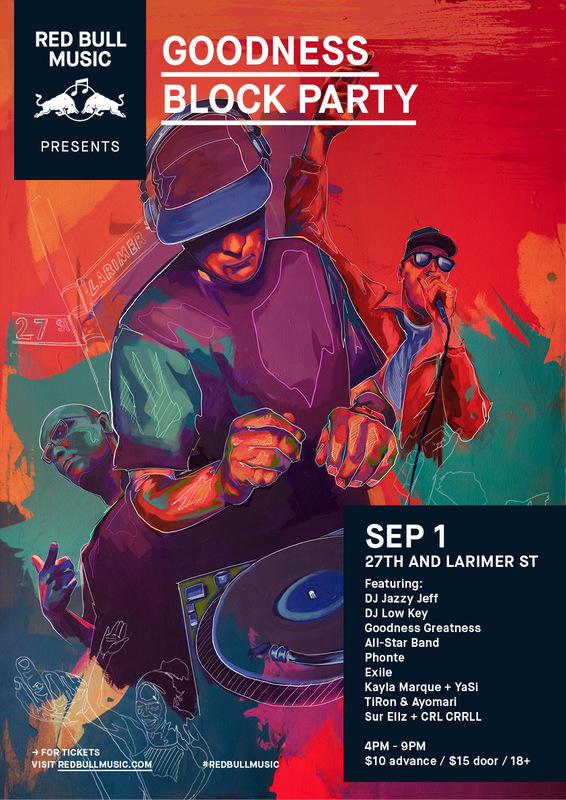 Taking over 27th Street between Larimer and Walnut, the Goodness Block Party will spill onto the space out front of its longtime home at The Meadowlark to feature a stacked lineup of hip-hop and soul inspired artists including DJ Low Key, DJ Jazzy Jeff, YaSi, CRL CRRLL, TiRon & Ayomari, Kayla Marque, and Sur Ellz. In addition, the event will host the debut of Goodness Greatness, an all-star band with Phonte, Exile and friends. Tickets are $10 in advance of the event, and are available HERE. DJ Low Key has been an influential presence in the Denver hip-hop scene for well over a decade, with his summer series Goodness now in its 7th season and his weekly the Solution (with fellow Denver fixture DJ Lazy Eyez) turning 12 years old next February. Bringing celebrated DJs and hip-hop legends from Denver and beyond to perform, DJ Low Key has created a space to showcase Denver’s unique, independent hip-hop, soul and DJ culture. With the Goodness Block Party, Red Bull Music and DJ Low Key look to highlight and celebrate the uniqueness of Denver’s East Side/RiNo neighborhood, shining a light on the community that has continued to build the area’s renowned musical and artistic legacy. “The name Goodness comes from the idea of featuring all the goodness possible at the party - from music to people to food to drink to art and beyond. Over time, that focus brought together a whole lot of interesting, like-minded people,” DJ Low Key explains. “Everything starts with the love of the music and then expands out from there in different directions, with a lot of unexpected great things coming from it... it’s a party for everybody, but not just anybody."